I’ve liked what I’ve seen of Chandor’s previous work (Margin Call and A Most Violent Year), even if I’d be hard-pressed to reach an opinion on what sort of filmmaker he is (a competent one, I guess), and he’s co-credited on the screenplay with the project’s originator Mark Boal, but there’s something faintly underwhelming about every aspect of Triple Frontier, even granted the evident polish of the production. Boal, a former journalist, is best known for his studies of the military machine (In the Valley of Elah, The Hurt Locker, Zero Dark Thirty), ones which leave one with a sense that he’s overly respectful of the edifice while being sure to pluck plaudits for threading in nominal critiques (Elah is by some distance the best of the three, and I wonder how much of that wasn’t Paul Haggis’ input). So it is here. 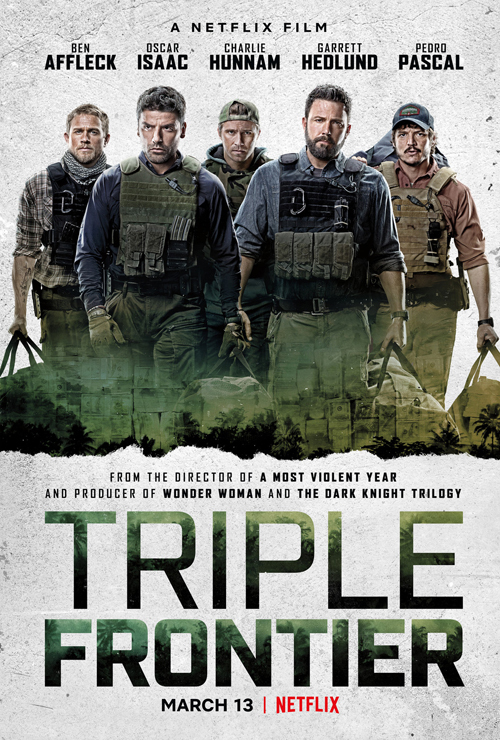 There have been references to Triple Frontier operating along the lines of Three Kings meets The Treasure of the Sierre Madre, but there’s none of the former’s irreverence or the latter’s escalating insanity and paranoia to exert a hold on the viewer. Indeed, this is fairly standard-issue “mercenaries on a mission” fare, even extending to the opportunity to both do something noble (topple Colombian drug lord Lorea) and slightly less so (steal his loot into the bargain, but hey, the authorities there are hopelessly corrupt, so if you want to get the job done and there’s a little extra loot involved, to the tune of $250m, that’s all gravy). In his first scene, Charlie Hunnam’s motivational speaker is giving troops a lecture about “the price of being a warrior”, evidence enough of how this will unfold tonally: dour veterans’ inability to adjust to civilian life, wracked with guilt over misdeeds done, and looking forward to getting back into the stylishly rendered, explosive action as a cathartic recourse (“We’re a dying breed. We were warriors”). This rather hollow reading is further emphasised by the casting, a quintet of pampered Hollywood types donning their best hard-man war faces. Oscar Isaac, who worked previously with Chandor on A Most Violent Year, plays Pope, the instigator of the mission. He’s fine, but I do wonder where Isaac’s career is heading, in the same way that Andy Garcia started out with so much promise and then just became “fine”, and we forgot all the “next Pacino” talk. Pedro Pascal barely registers, while Garret Hedlund (as Hunnam’s brother) stands out only for looking more like a stoned surfer than a battle-weary vet (we’re also asked to believe he’s taken up a career as a mixed marital artist, so there are several serious stretches there). Hunnam’s the conscience of the group, at least to an extent, as the quintet seem to assume positions according to the dictates of the scene, not having been fleshed out in sufficiently differentiated fashion at the outset. Beefy Batfleck has the most to chew on, in theory, as the real estate salesman unleashed in batty Bogart fashion when he gets a whiff of the loot, but sadly, one gets the impression this element was rather reined in somewhere along the way. He gets greedy, sure, but his perfectionist planner is quicky regretful for how his actions lead to their coming unstuck (“I killed those people” he professes, after a village massacre. “No you didn’t. We all did” comes back surfer martial artist dude, who later recklessly burns a load of money, KLF style, but with the excuse of wanting to keep warm. A donkey also goes over a cliff, though not as a result of mixed martial arts action, which is more affecting than any human casualties). Indeed, there’s a sense of pulled punches throughout, that the material might have been on course for more all-out existential crisis territory, pitting former colleague against former colleague amidst the unforgiving elements. The sort of thing where Liam Neeson has to square off against a pack of hungry wolves after his fellow survivors are whittled down. Instead, it’s only Batfleck who comes a cropper, and in the last scene, helpful Hunnam even presents Isaac with the co-ordinates of the ravine they dropped their loot down (to be revisited when and if Netflix asks for Quadruple Frontier). The only discernible price paid is nobly giving up their shares of the meagre sum they escaped with to Batfleck’s family trust fund. Boam and Chandor make vague gestures towards the paraphernalia of modern warfare and irrevocably damaged psyches, but so glibly that most of the proceedings wouldn’t look out of place in a forty-year-old Christopher Walken movie made from a Frederick Forsyth novel.